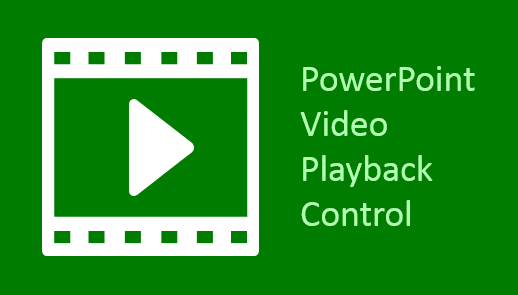 When you insert videos in PowerPoint and then run them in a slide show, the most common way to use them is to play them from the start, wait until they have finished and then move on to the next slide. You can of course use the Play, Pause, Stop and Seek animation controls to get greater control of your video. But what happens if you want to leave your slide and then come back to it at some point later to pick up from the video at exactly the same time you left it? It’s not possible in PowerPoint… unless you use a VBA macro. And we’ve designed one for you to use for free! If you’ve never used a VBA macro in PowerPoint before, check out our short tutorial which explains how to insert a macro in PowerPoint for the PC or Mac.
' Copyright (c) 2014 YOUpresent Ltd.
' "Includes code created by YOUpresent Ltd. (YOUpresent.co.uk)"
'           when returning to that slide during the slide show session. 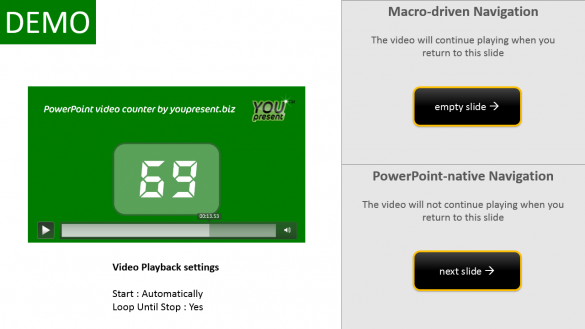 Public Const VideoName = "Video"
PowerPoint automation can improve productivity to an amazing degree. If you’d like custom macros developed or an add-in developed that adds your own specified buttons to the PowerPoint ribbon, contact us to discuss your ideas.